Printer manufacturers often offer low cost printers, subsidising them with expensive ink cartridges. Epson's EcoTank range takes different approach; the company wants to charge a little more upfront, and a little less for ink. This is achieved by ditching cartridges. 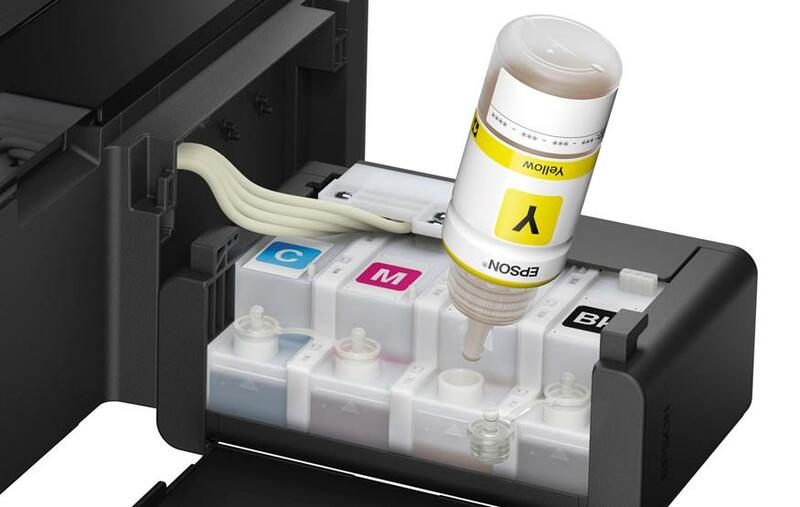 Epson's EcoTank ink jet printers abandon cartridges in favour of user-refillable ink tanks. Ink pots are priced at AUD$16.99 for pink, yellow and cyan, and AUD$24.99 for the larger black refill. A complete set is said to last for two years, roughly the equivalent of printing 4,000 pages in black and white or 6,500 pages in colour. The ink does not have an expiry date, so slower users could comfortably take tanks past the two year point without any repercussions. While many printers come with half or quarter full cartridges, the EcoTank family comes with full tanks. A user does however need to have ink in all four tanks to be able to print. Epson currently has four EcoTank printers, dived into two families: Expression and WorkForce. The Expression printers start at AUD$449 are intended for home use, and the WorkForce range starts at AUD$599, and as the name suggests, are intended for small businesses. All four printers are multi-function models. Harvey Norman, Bing Lee, JB Hi-Fi and Bing Lee all stock the EcoTank family and should have the printers in stores now.